Orange hued rough Quartz Crystal Points from Zambia, Africa. 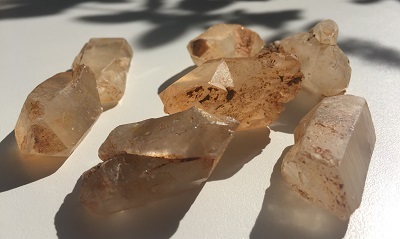 These hematite infused quartz crystals energetically add a zesty vibration to life and would make an excellent crystal tool for recharging the base and sacral chakras. These Zambian points have a nurturing, mothering energy. 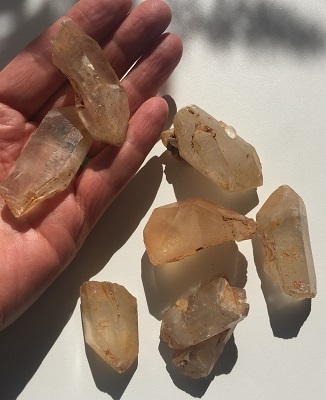 Zambian Quartz crystal are helpful crystal tools for revisiting past decisions and the impact of any trauma involved with those life lessons. 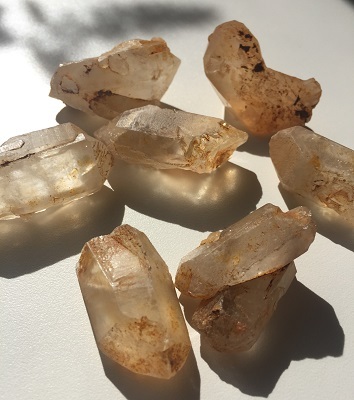 Zambian Quartz crystal may be helpful in overcoming karmic misuse and abuse of power. Zambian Quartz Crystal dissolves negativity and prevents negative energies from entering the aura. Zambian Quartz restores the capacity for enjoyment, opening one to both give and receive pure pleasure. Zambian Quartz Crystal facilitates loving relationships and the attraction of love. 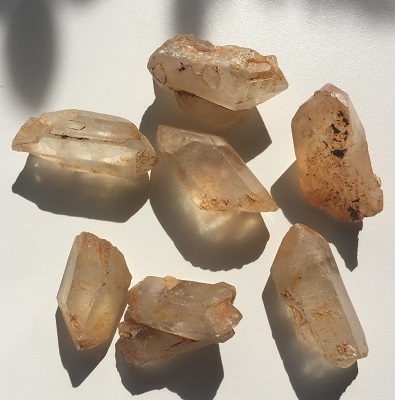 In healing, Zambian Quartz Crystal is an efficient healer as it helpful in the clearing and realignment of the meridians of the body aiding with energy flow. Quartz is a master healer and may be used for any condition. Zambian Quartz supports the blood, liver and spleen. Zambian Quartz Crystal regulates blood flow, increases the strength of red corpuscles, stimulates the immune system, and the reproductive organs.